Originally at this URL there was a post about "5 Hurricane Sandy Newsjacks from Marketers". The tone of the post was in poor taste and we apologize for promoting the idea of newsjacking a tragedy. Thank you to David Meerman Scott and others for pointing out the error in our judgement. HubSpot is making a $5,000 donation to the Red Cross (donate here) to help those harmed by Sandy. However, a number of companies have actually tried to newsjack the storm, and we now want to know what you, the marketing community, think about these attempts. This is an important lesson for marketers. Were they in good taste or bad taste? David Meerman Scott has said that Sears attempt was good, but the cosmetics promotion was bad. I actually think the Sears one might be in poor taste too. 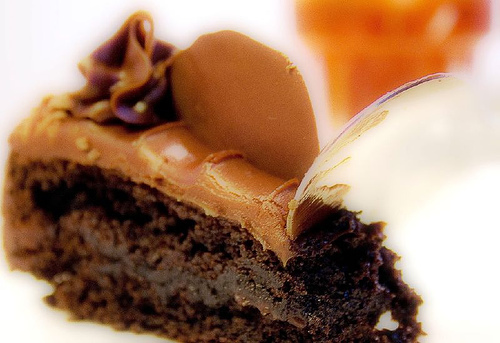 As the marketing community figures out the limits of newsjacking, what do you think? Have any of these gone too far? Are any of them ok? What other examples do you have of good or bad newjacking? Let's use the comments to discuss what the limits and guidelines should be for newsjacking. For the sake of transparency, you can see the original post and its comments here. Newsjacking is the practice of capitalizing on the popularity of a news story to amplify your sales and marketing efforts. 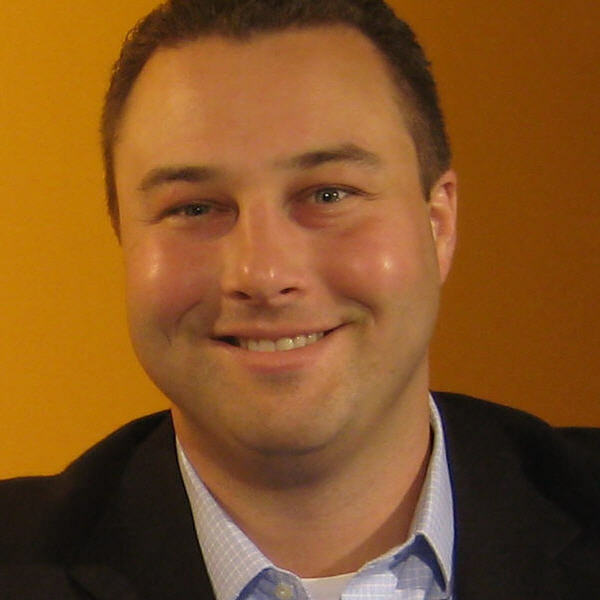 The term was popularized thanks to David Meerman Scott's book Newsjacking. Below are some examples of people newsjacking the storm. What do you think about them? Neel Patel, an eclectic & eccentric entrepreneur, created a Pinterest board titled Hurricane Hair. The board features fashionable pictures showcasing floating dresses, loose T-shirts and spiked hair. Neel's Pinterest board was featured on BuzzFeed, but has accumulated only 59 followers and 69 pins so far. 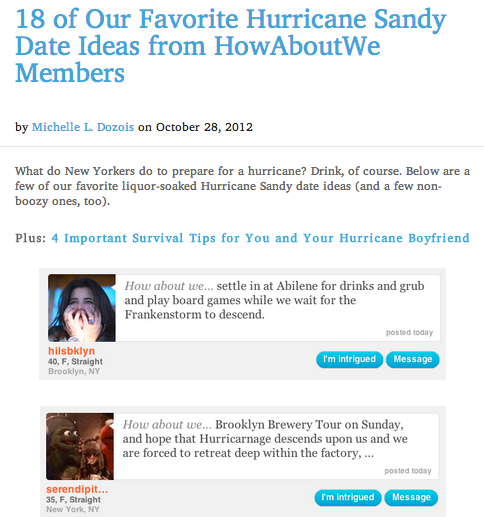 Online dating site HowAboutWe published a blog post titled "18 of Our Favorite Hurricane Sandy Date Ideas from HowAboutWe Members" that explores hurricane-themed date ideas from members. This content piece borrows from the conversation already happening in the HowAboutWe community. The company spotted the trend, compiled the list of date ideas, and posted a light-hearted piece that also represents the identity of its target audience. "We should all be prepared for emergency situations whether they’re expected or not. There may be a time when running to the store won’t be an option, and that’s why Emergency Essentials exists. They’re an Orem, UT based company that has been “helping people prepare for emergencies” for the last 25 years through their catalog, website, and retail stores." 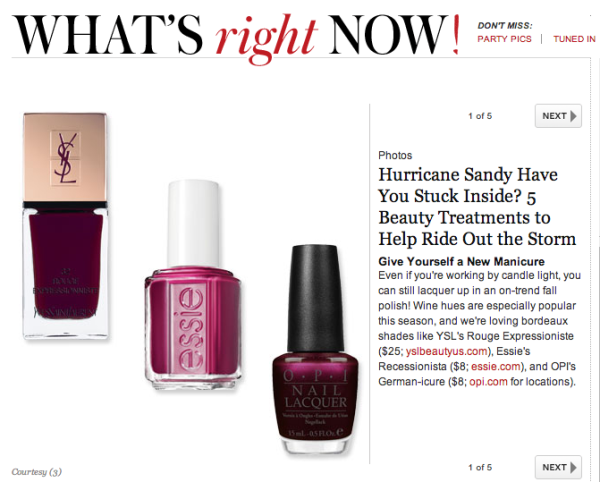 InStyle magazine is offering a special package of cosmetics under the thematic name Hurricane Sandy Have You Stuck Inside? 5 Beauty Treatments to Help Ride Out the Storm. "The weather outside is frightful -- which is all the more reason to stay indoors and pamper yourself," wrote the author Marianne Mychaskiw. "So we rounded up 5 beauty treatments that will help keep you occupied (and gorgeous) as you safely wait out the storm." A lot of companies have been customizing their social media updates to reflect something about the hurricane. This especially makes sense for stores offering food supplies and household items, a hot commodity in hurricane situations. 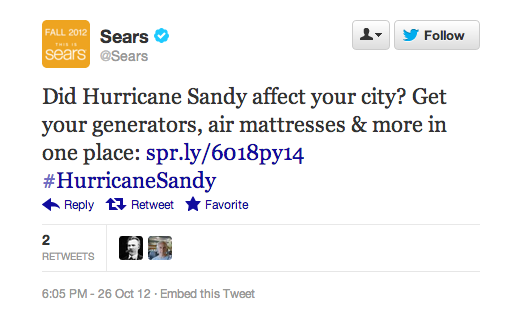 Sears, for instance, put together a special page with household essentials, such as generators and air mattresses. What hurricane-related marketing have you seen so far? Do you think any of these (orother) examples were taking the concept of newsjacking too far? Share your thoughts in the comments below and let's as a community figure out what the guidelines should be.